I stopped by the Kahala Aloha Mini Mart on my way home (on my bicycle) Monday and they now have a Level III charging station. It will be ready for use on Wednesday (they are having a ceremony at 10:00 am). There is also one available at the Aloha Mini Mart in Waipio and the Shell in Kailua. I've confirmed the Waipio one is open but don't know for sure about the Kailua one. I paid extra for the level III capacity so I'm happy to finally have some available on the island! Apparently they will be free during an introductory period (I'm not sure how long that will be). What brands of L3 ? Blink, 350green, AV, Eaton, other ? 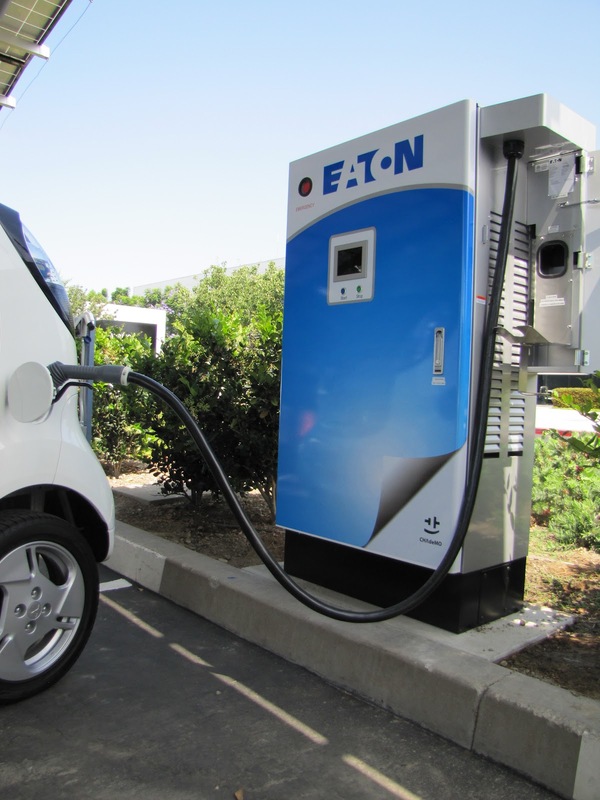 ...Thanks to the cooperative efforts of Mitsubishi Motors and diversified power management solutions company Eaton Corporation – an official electric vehicle charging equipment supplier for MMNA and supplier for commercial Level 2 charging stations at its EV certified dealerships – the Honolulu area and the island of O'ahu are seeing a rapid expansion in the number of safe and convenient Eaton electric vehicle (EV) charging stations installed on Hawaii's most populous island. It is free for "a couple of months", I have been told be the station manager. You have to go in to the store to have the attendant swipe the FOB if you don't have an AeroVironment card yet. Note to the person who was plugged in way past being full--please don't just leave your car parked there past your charge time! That is not fair to others. Let's all play nice and share these. Thanks. Ask the owner to please put up a standard 30 minute time limit on the parking space sign or you will be towed with reference to the vehicle code and towing company. Good ole, standard parking time limit or you will be trowed sign is the easy, standard way to solve the problem in a way that people have been familiar with since they started driving. The one at Kahala broke the first day. According to the attendant I talked to someone tried to put it in wrong, forced it, and broke a pin. They hope to have it fixed later this week. Try calling first if you are planning on using it. akohekohe wrote: The one at Kahala broke the first day. According to the attendant I talked to someone tried to put it in wrong, forced it, and broke a pin. They hope to have it fixed later this week. Try calling first if you are planning on using it. ok, i admit i have ONLY used AV DCFCs so have no experience with Blink or Eaton, but how can one put it in wrong? does not the plug simply plug in straight up? no twist handle to left, no twist handle to right?? just straight in right?